Please see Ticket Terms & Conditions here. For this show you’ll need to display your ticket on your phone via the AXS app. Our official ticketing partner AXS will send you an email closer to the show when your ticket is ready. You can find out everything you need to know about Flash Mobile Delivery here. This will be the first Daryl Hall & John Oates headline tour in the UK for five years. After another incredible touring year, which included such legendary venues as Madison Square Garden and The Forum, Daryl Hall & John Oates will will return to the U.K in April. 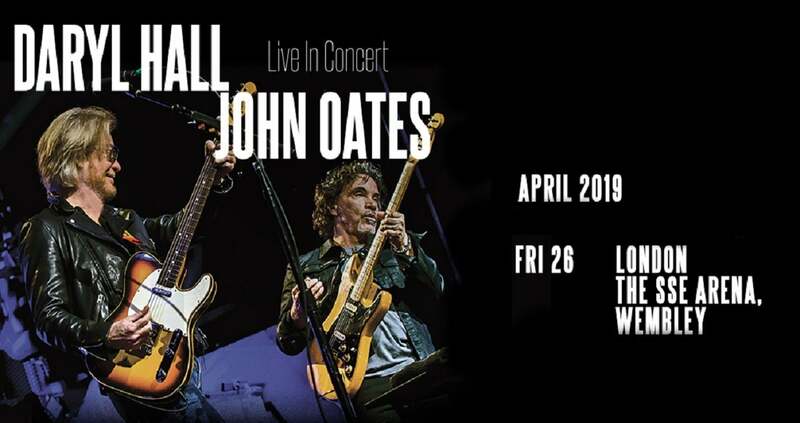 Daryl Hall & John Oates bring their show back to the UK for their first tour since July 2015 and their first European show since their triumphant sell-out headline set at The O2 for Bluesfest in 2017. From the mid-'70s to the mid-'80s, the Daryl Hall and John Oates scored six #1 singles, including "Rich Girl" (also #1 R&B), "Kiss on My List," "Private Eyes," "I Can't Go For That (No Can Do) (also #1 R&B), "Maneater" and "Out of Touch" from their six consecutive multi-platinum albums -- '76's Bigger Than Both of Us, '80's Voices, '81's Private Eyes, '82's H2O, '83's Rock N Soul, Part I and '84's Big Bam Boom. The era would also produce an additional five Top 10 singles, "Sara Smile," "One on One," "You Make My Dreams," "Say It Isn't So" and "Method of Modern Love." In 1987, the RIAA recognized Daryl Hall and John Oates as the top-selling duo in pop music history, a record they still hold today. In 2018 Daryl and John had a top 10 hit on the AC charts with “Philly Forget Me Not,” featuring Train.